The Chinese public is increasingly concerned about the quality of the country’s air and water after a year in which China experienced numerous high-profile environmental problems. Meanwhile, even though most Chinese have rated their national economic situation positively in recent years, there are also widespread concerns about the side effects of economic growth, such as rising prices and the gap between rich and poor. And, more than half (53%) describe political corruption as a very big problem – an issue highlighted most recently by the trial of former Chongqing Communist Party boss Bo Xilai. As their disposable income grows, many Chinese are worried about the safety and quality of the goods they are consuming. The percentage of Chinese identifying the quality of manufactured goods and the safety of food and medicine as major challenges has risen sharply over the last five years. Concerns about consumer issues are common across all segments of Chinese society, but they are especially widespread among those who have in many ways benefited the most from the country’s long run of economic expansion – wealthier Chinese, urban residents, and people under age 30. These are among the key findings from a survey of China conducted by the Pew Research Center between March 4 and April 6, 2013. Face-to-face interviews were conducted among 3,226 respondents.1 Overall, the survey highlights an evolving set of priorities for the Chinese public. As the country’s wealth grows and millions move into the middle class, issues such as the environment and consumer safety are moving to the forefront. At the same time, many believe the country’s economic growth is benefiting some more than others, with the rich and the politically connected reaping more than their share of the rewards. However, this optimism coexists with a growing set of concerns. Among the 17 issues included in the survey, eleven are considered either a very big or moderately big problem by at least 70% of respondents. Three issues are rated as a very big problem by more than half of those polled. Inflation tops the list of public concerns. Roughly six-in-ten Chinese (59%) say rising prices are a very big problem, although this is actually down from 72% in 2008. Meanwhile, inequality is also a major concern, with 52% rating the gap between rich and poor a very big problem. 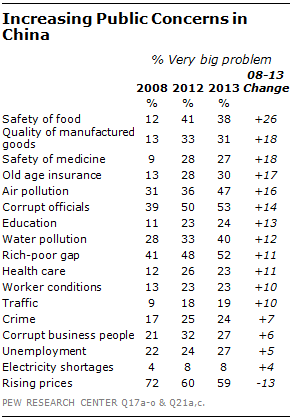 Such unease is little changed from 48% in 2012, but up significantly from 41% in 2008. About seven-in-ten (69%) say the gap between rich and poor has increased in recent years. Similarly, concerns about political corruption have grown over time – 53% say corrupt officials are a very big problem, up from 39% in 2008. Just since last year, there have been significant changes in views about the environment. In January, air quality in Beijing and several other major cities reached record lows, and the public is increasingly taking note of this issue. 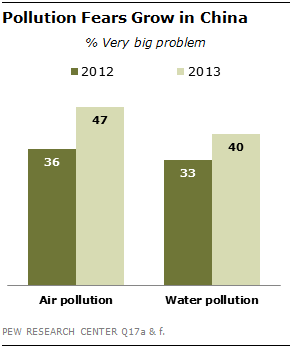 Nearly half (47%) rate air pollution a very big problem, an increase of 11 percentage points from 2012. And following a year that included headlines about thousands of dead pigs floating down a river through the center of Shanghai, concerns about water pollution have also increased. Four-in-ten say it is a very big problem, compared with 33% last year. Food safety is another issue that has made headlines in recent years, with scandals involving issues such as infant formula and other products. About four-in-ten (38%) consider the safety of food a very big problem, a 26 percentage point increase since 2008. Other consumer issues are also seen by many as major challenges, including the quality of manufactured goods. Roughly three-in-ten (31%) describe this as a very big problem, up from just 13% five years ago. Similarly, 27% hold this view about the safety of medicine, compared with 9% in 2008. 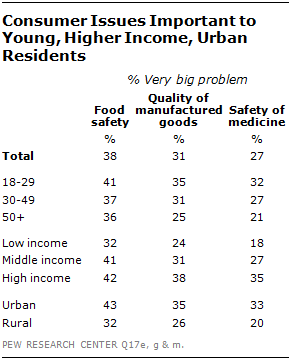 Food safety, the quality of manufactured goods, and the safety of medicine tend to be especially high concerns among 18-29 year-olds, people with higher incomes, and those who live in urban areas.